4WD, ABS brakes, Compass, Electronic Stability Control, Front dual zone A/C, Heated door mirrors, Heated front seats, Heated rear seats, Illuminated entry, Integrated Trailer Brake Controller, Low tire pressure warning, Navigation System, Remote keyless entry, Traction control. CARFAX One-Owner. Clean CARFAX. White 4WD 2018 Ford F-150 King Ranch EcoBoost 3.5L V6 GTDi DOHC 24V Twin Turbocharged Odometer is 8474 miles below market average! Proudly serving Kentuckiana for over 40 years with an A+ BBB Rating! Having 7 convenient locations and over 800 vehicles, we're sure to have the right car at the right price! Inquire to schedule your VIP test drive today. All prices plus tax, title, lic, and dealer processing fee. More pictures and a free CarFax Vehicle History Report are available on our website. Go to www.craigandlandrethcars.com to see our entire inventory. You can apply for financing safely and securely on our website too. 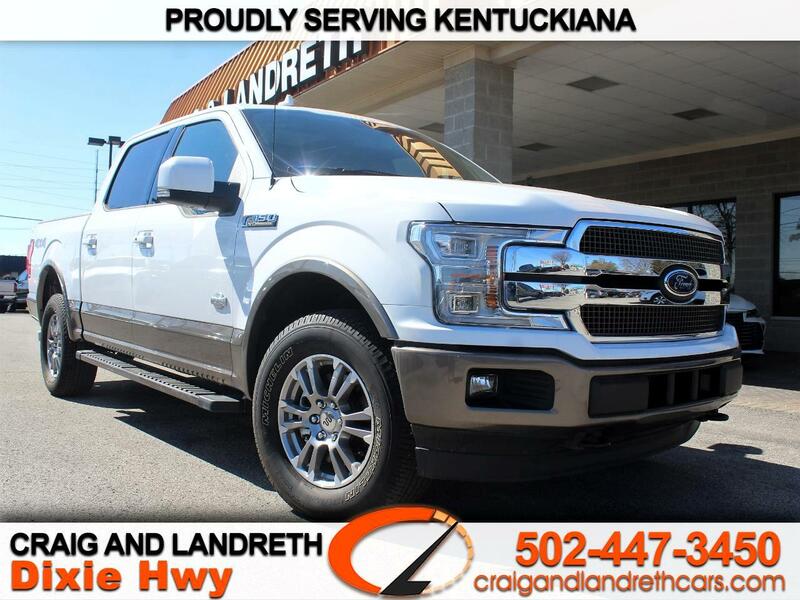 Call or Text 502-447-3450 As always, all trade-ins are welcome! Now you're thinkin' smart!